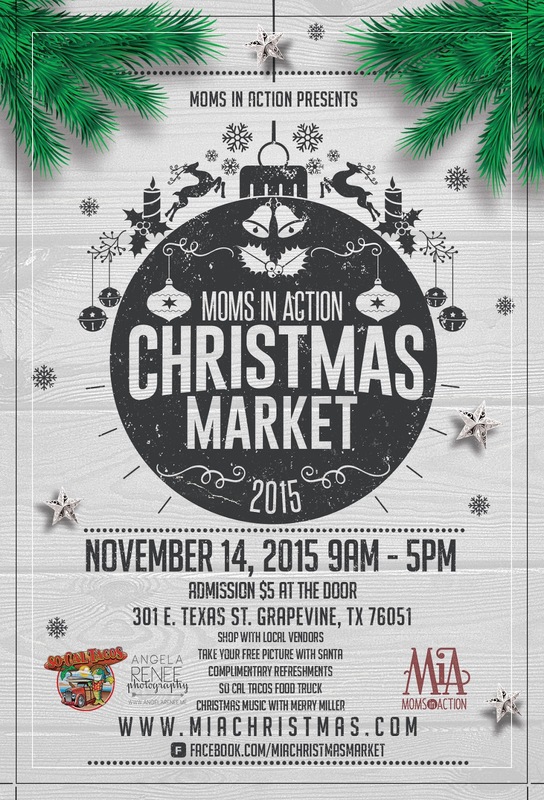 "The Moms in Action group of FBC Grapevine presents the 2nd annual Christmas Market on November 14, 2015 from 9-5. Vendors will showcase their products and help you prepare for the busy Christmas season. 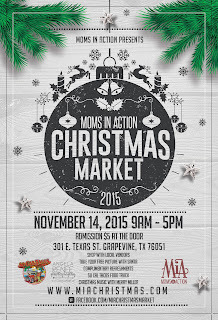 Come get your shopping done at the MIA Christmas Market this year! FREE pictures with Santa from 10-2." Event will be located in the church gym and fellowship hall. Signage and volunteers will be strategically located to help guests. Admission Fee: $5 at the door or purchased online. Complimentary snacks and beverages will be provided to shoppers as well as a food truck during lunch for purchase. All booth fees include a table and chair and one complimentary lunch. Sodas, water and coffee and snacks available to vendors throughout event. Our staff is ready to help in any way during the event. Electric is available in limited quantities, extra fees may apply. Only accepting direct sellers who participated in previous years. Applications are available here and are due by June 5th, 2015 ASAP. For more information, visit their website or contact their event coordinator at grapevinemia@gmail.com. 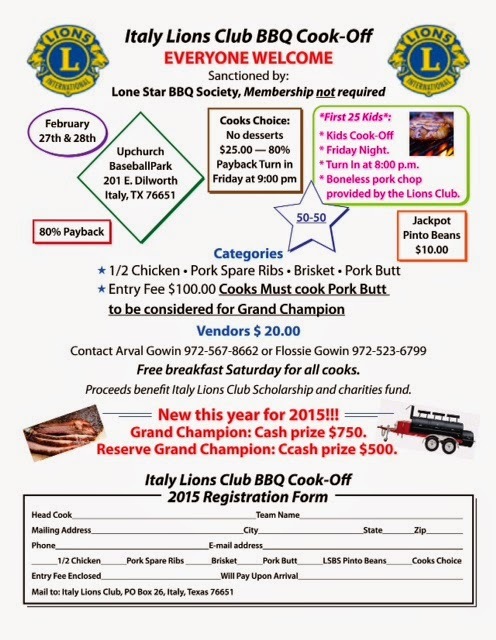 "This is the Italy Lions Club 6th BBQ Cook-off and we are growing each year. This will be our second year inviting vendors to our event." Booths are a 10x10 tent - $150.00 + $50.00 electricity. This fee includes table and 2 chairs are included. Applications are available here and are due by September 04, 2015. For more information, contact their event coordinator at fmsmith@gptx.org. "The City of Grand Prairie Parks, Arts and Recreation Department is hosting the 4th Annual Main Street Fest. Along with our selected performers, the festival will celebrate the fun, festive, family atmosphere of Grand Prairie with LIVE! music featuring headlining performances, spectacular BMX/Skate Street Shows, Local Entertainment, Carnival, Arts & Crafts Area, Business Expo, Food and Beer Gardens, a KIDZONE and so much more! Last year’s Main Street Fest, attracted over 12,000 visitors. With great weather and the success from last year, the 2015 festival is projected to bring an expected attendance of 16,000 visitors. The improved access to the event with the opening of Main Street in the heart of Grand Prairie will make traveling to the festival and leaving after the event much easier and quicker for all." Booths are 10 X 10 and cost $200. This fee includes 1 6ft. table, 2 chairs and lighting. Applications are available here and are due by April 03, 2015. For more information, visit their website or contact their event coordinator at ewhitlock@gptx.org / or for inquiries into the Arts and Crafts Area, please contact Mae Smith at (972) 237-8107. "Join us for a one day shopapalooza! We'll have a wide variety of vendors selling handmade goods as well as representatives from some of your favorite direct sales companies. The youth will be having a bake sale there as well." The Holy Family Life Center is located just behind the church. Parking is in back as well as in the St. Maria Goretti Lot on Benge St.
Booths are 6 X 8 for $30. This fee includes 1- 6 ft. table, limited number of booths available with electricity. For more information, contact their event coordinator at smgyouthfundraising@gmail.com. "Come enjoy a beautiful day of wonderful local art in a unique setting. Now in it's 8th year, Eliza's Art In The Yard is a one-of-a-kind show for Dallas. A wonderful group of local fine craft artisans gather for this one day event held in a magical yard in the heart of Dallas. Always a great selection including glass, woodwork, ceramics, fiber art, jewelry and more. Bring your kids, family and friends! " The show is held at a private residence in the area off of Inwood between Lovers and Northwest Highway. *Please note all Jewelry spaces have been booked. This fee includes bagels, donuts and coffee available during set up on day of show. Electricity is not available. Please bring your own lunch/drinks/snacks. Limited number of tables available for rent, please inquire. For more information, visit their website or contact their event coordinator at eliza2e@yahoo.com. "Where can you find 10 Exclusive Vendors in one place? At our Vendor Open House. 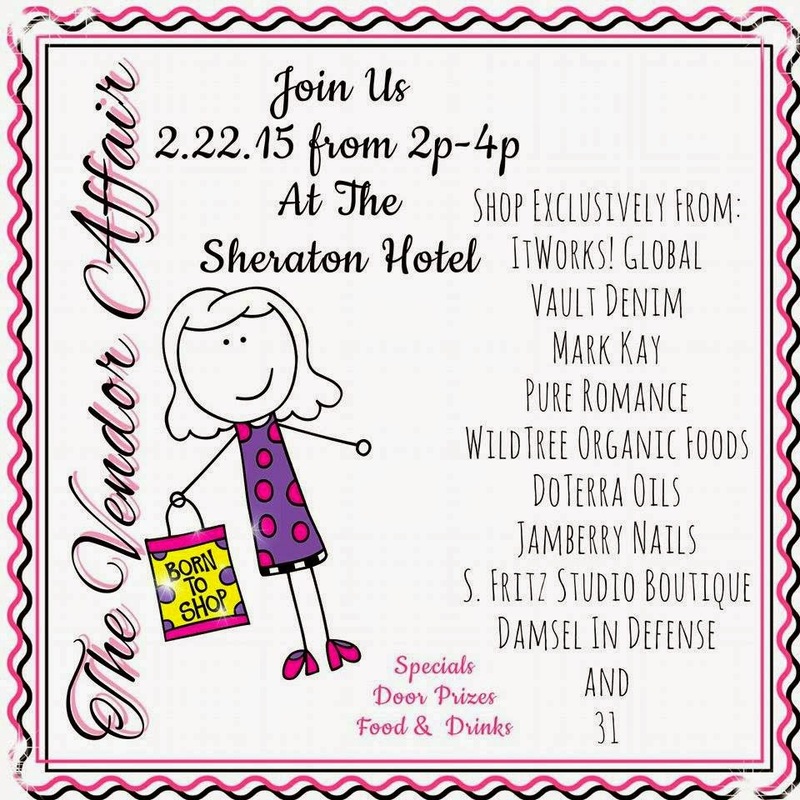 Come shop some amazing products, special deals and door prizes from each of our vendors! Drinks and Snacks will be provided as well. 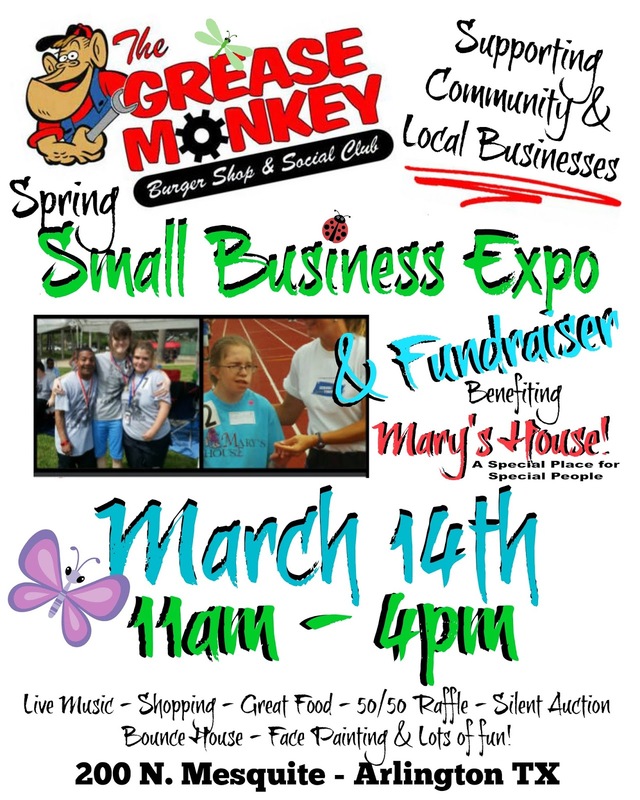 So make sure to stop by and shop, grab a bit and WIN a door prize!" For more information, contact their event coordinator at jennifer-medina@live.com / 214-514-8785. After March 30th, an additional $10 fee applies. Applications are available here and are due by February 27th, 2015. For more information, visit their website or contact their event coordinator at jeff.florey@bedfordtx.gov / 817-952-2317. For more information, visit their website or contact their event coordinator at sharryjones@ymail.com. 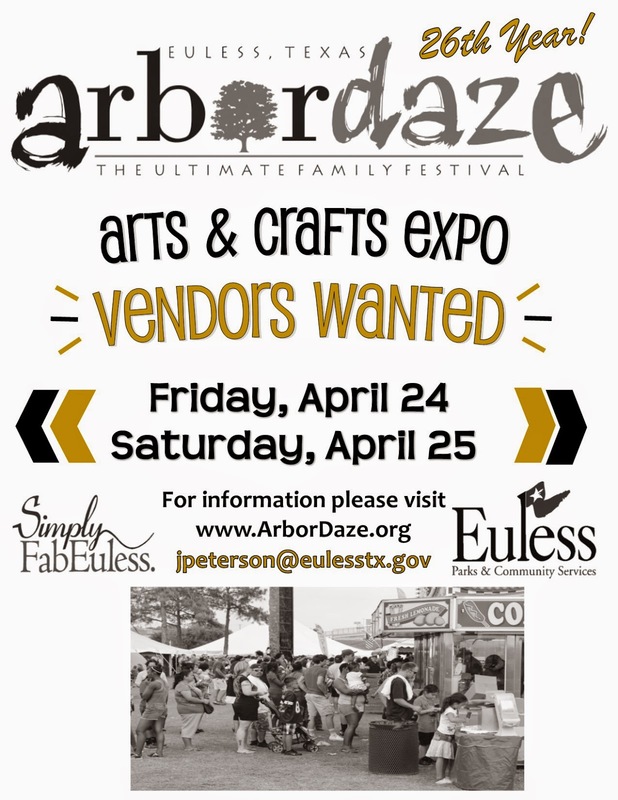 "We are featuring a wide variety of Vendors, indoors, so the event is happening rain or shine. Come join us for some Saturday Shopping, eating, and browsing. we would love to have you!" Applications are available here and are due by March 15th, 2015 . For more information, contact their event coordinator at woodrowfundraising@gmail.com / Kayti (214) 729-3940 / Stacy (940) 453-8753. "Come celebrate the arrival of summer with over 20 vendors! With both indoor and outdoor vendors, our summer show is a family-friendly carnival-style event complete with face painting, a bounce house obstacle course, games, concessions, shopping, and more!" One 6' table and two folding chairs are included for each booth. Electricity may be available upon request. Applications are available here and are due by March 04, 2015. For more information, visit their website or contact their event coordinator at countdownvendorevents@gmail.com. Booths are 10 X 10 and cost $50. Applications are available here and are due by Sept. 25th. Contact via phone before mailing applications for independent consultants. For more information, visit their website or contact their event coordinator at ATexasGirlBlogs@gmail.com / 817-716-9757. 10x10 - $65. This fee includes WiFi. Applications are available here and are due by May 15th, 2015. "Come shop at over 90 booths featuring handmade crafts, wooden crafts, jewelry, candles, clothes, children's items, food, healthcare, totes, ladies handbags, quilts, crocheted items and many more vendors. ADMISSION IS FREE!" Admission: We are asking customers to donate food items for local pantries, but admission is free. Booths are 10 X 10 and cost $65. WiFi and electricity are available. Tables available for $5. Applications are available here and are due by April 30th, 2015. "Join us for a day of shopping complete with quality handmade gift items. Come pick that special gift for Easter, Mother's Day, Graduation, and Father's Day. Our vendors will be found in our new Family Life Center just one mile north of Hwy 380 on Hwy 377. " Electricity is $10, Tables are $10, Chairs are $5. For more information, visit their website or contact their event coordinator at bwilky1124@yahoo.com. "Red River Mardi Gras & Jazz Festival is a fantastic, downtown event with lots of food, crafts, music & fun! Jazz & zydeco on 2 stages as well as a shrimp & crawfish boil, craft beer & hurricanes and lots of unique crafters. And don't forget the beads!" "Searching for a new opportunity? Ready to get Out of Debt? Looking for a new passion? Ready to hear great speakers motivate and stretch your enthusiasm? 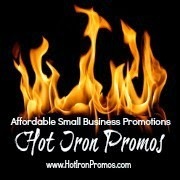 Love to shop and support small business?Looking to network with women? Then this event is for you!" Booths are a 6 FT table and cost $90. Late fee may apply after 2/15. This fee includes 6 foot table and 2 chairs, swag place insert placement (200 bags), and social media shout out. Linens are not provided. We are only allowing 1 per company (Direct Sales, MLM, Network Marketing) and 1 per industry (insurance, financial representative, fitness person, virtual assistant, graphic designer, etc). If you belong to a direct sales, MLM or network marketing company, you can team up with others and share the booth. Only 1 payment will be accepted though. Maximum of 3 persons per vendor table at a time. Applications are available here and are due by April 15th, 2015. Booth are 10 X 10 for $50. Outside event only. Applications are available here and are due by May 1st 2015. For more information, visit their website or contact their event coordinator at ATexasGirlBlogs@gmail.com / 817-716-8757. Booths are 10 X 10 and cost $30. Applications are available here and are due by February 04, 2015 (or the Wednesday before the event). For more information, visit their website, Facebook, or contact their event coordinator at forneytradeonmain@gmail.com / Keesha 972-693-1611.